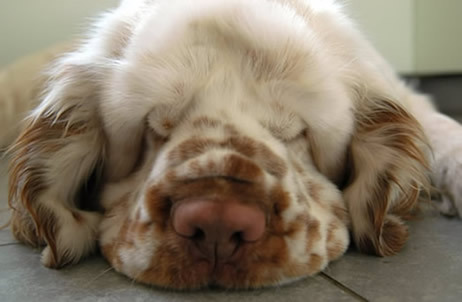 The Clumber Spaniel is one of the original nine breeds registered by the American Kennel Club. Long and low, it’s not as fast as other sporting dogs, but will work all day, trotting along in a slow, rolling gait. 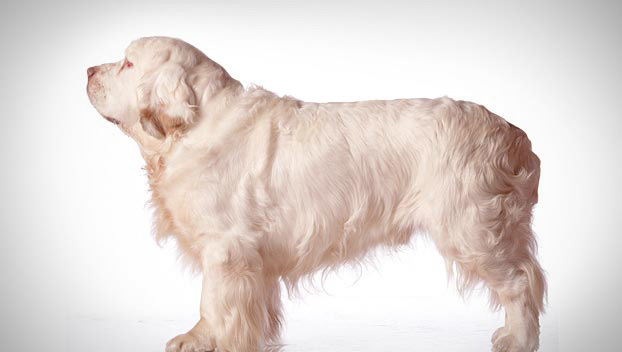 Dignified and pensive, but possessing great enthusiasm, the Clumber Spaniel also has a beautiful white coat. The largest of all spaniels, the Clumber Spaniel is a dog fit for a king. And indeed, much of the breed’s early history centers around French and British nobility. Bred to be a gundog that specializes in hunting in heavy cover, the Clumber Spaniel has the long, soft coat characteristic of all spaniels. Most Clumbers are white in color, while some specimens display brown, lemon or orange markings. It is fairly powerfully built dog with heavy bone structure and a massive head. This large muzzle enables the Clumber Spaniel to retrieve all types of game. The Clumbers have ‘melting’ heads and their faces take on a sleepy, mournful expression. 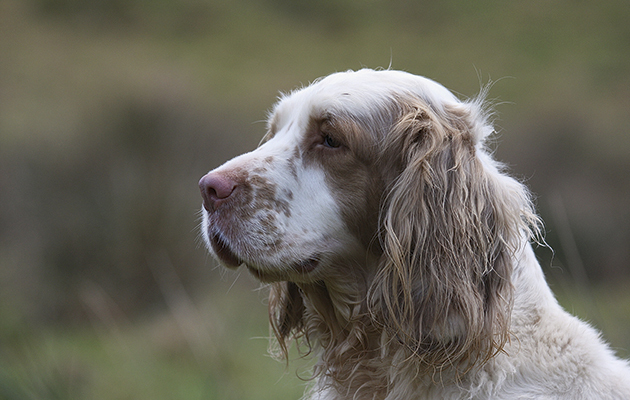 Although not as fast as most other breeds of spaniels, the Clumber has great stamina and is able to trot along at a slow gait for hours on end. It is also a highly intelligent dog capable of independent thinking. These characteristics make it an excellent hunting dog; a task the breed was used for prominently amongst the British aristocracy. They are also gentle and loving and make excellent pets as well. The Clumber’s long, soft coat is white, with lemon or orange markings. Expect to find Clumber drool in odd places, like the roof of your car. They have been known to fling spittle up to five feet up and six feet out. Insomniacs take note: Clumbers snore. A drawing of two Clumber Spaniels from 1858. 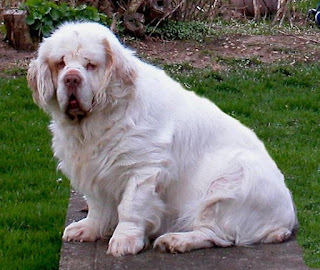 The history of the Clumber Spaniel is unclear. Current thinking is that the breed was developed by hunters and gamekeepers in the latter part of the eighteenth and first half of the nineteenth centuries – who bred dogs to fit function to practical demands. The breed name comes from the Duke of Newcastle’s estate at Clumber Park in Nottinghamshire, England. A number of titled families and local gentry hunted in that area, known as “the Dukeries,” with Clumber Spaniels, and apparently bred them with the Duke’s dogs to create this fine hunting spaniel. Old pictures of this breed depict them almost always as white and orange, with less bone and smaller heads than today’s breed. Clumbers were first shown in England in 1859. The breed came to North America in 1844, coming to Canada with a Lieutenant in Her Majesty’s 97th Regiment stationed in Halifax, Nova Scotia. The first Clumber recognized by the American Kennel Club was in 1878, six years before the American Kennel Club was founded. It is clear is that the breed was created to be low to the ground in order to quickly search through the underbrush while on the hunt. Its low and rolling gait was developed for endurance instead of agility or speed. This is a gentle, loyal and affectionate dog with an intrinsic desire to please. Clumber Spaniels are odd-looking, bottom heavy dogs who usually have no idea just how big they really are. They will try to climb on laps, or will lay on feet, with complete disregard for the comfort level of the person they are smothering. They are a happy breed, eager to greet anyone and everyone at the door. Clumbers are not guard dogs, they'll happily walk away with a stranger if you aren't paying attention. Excited Clumbers will pick up the nearest item that will fit in their mouths and shake their entire rear end while tail-wagging, which can lead to hours of laughter. They are polite dogs who rarely make a nuisance of themselves and would much rather sunbathe than alert you that the mailman is approaching. 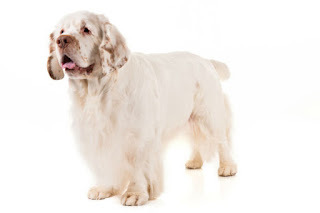 The Clumber Spaniel, which has an average lifespan of 10 to 12 years, is susceptible to intervertebral disc disease (IVDD), a major health concern. Besides this particular disease, some of the other minor health problems that the breed is prone to are otitis externa, ectropion, and entropion, as well as seizures. To identify some of these issues, a veterinarian may recommend elbow, eye, and hip exams early on. 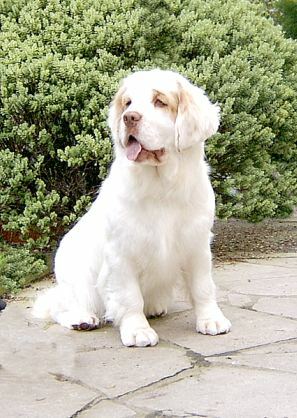 The dense, flat coat of a Clumber Spaniel requires combing at least two to three times a week. Additionally, regular bathing is essential to keeping its coat clean and neat. Its exercise requirements, meanwhile, consist of daily outdoor walks or long, energetic games. Be aware that some Clumber Spaniels may snore occasionally or drool. Clumbers are moderately easy to train. Positive reinforcement and a lot of treats are the only way to get a Clumber to do what you want them to do, but they pick up on commands quickly when they learn there is food in the deal. Treating a Clumber with a harsh hand will result in his absolute refusal to move. A Clumber who doesn't appreciate a trainer's tone will sit down and refuse to go any farther, so patience and enthusiasm must always be employed. Consistency is also very important when training a Clumber. They are like teenagers, always looking for a loophole in the rules and will test boundaries daily. 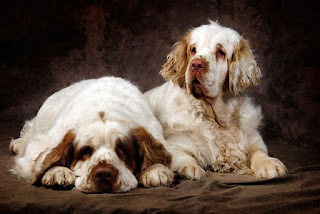 Clumber Spaniel puppies are highly playful and have a great deal of energy. They however slow down significantly as they age and aren’t very active as adults. This makes them unsuitable for active, athletic owners that enjoy jogging and hiking with their dogs. However, they do require at least an hour of walking exercise each day. They also enjoy carrying things in their mouth as it gives them a meaningful task to be engaged with. Clumbers shed year round, and during season changes can shed quite heavily. Brushing should be conducted on a daily basis to minimize debris around the house, as well as removing loose hair from the dog's body. Trimming may be done on the rear legs, tail or feet and a breeder can teach the proper technique. The white coloring of the Clumber can make the dog appear dirty more often than he looks clean. But regular bathing won't damage the dog's coat, as long as the shampoo is made for dogs and is a gentle formula for frequent baths. A Clumber's ears should be checked every week for signs of irritation and infection. Because the ears hang, they can be prone to wax and bacterial build up. Use only a veterinarian-approved solution when cleaning a dog's ears. Teeth should be brushed weekly to prevent bad breath, gum disease and tooth loss, and if the dog goes not naturally wear down his toenails, monthly trimmings may be required. 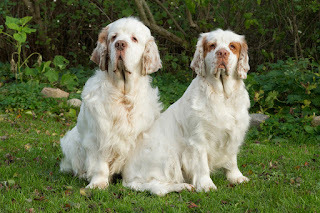 Is the Clumber Spaniel the Right Breed for you? Moderately Easy Training: The Clumber Spaniel is average when it comes to training. Results will come gradually. Some pretty important Brits were enamored with the Clumber Spaniel: Queen Victoria’s husband, Prince Albert, as well as Edward VII, were both fans of the breed.